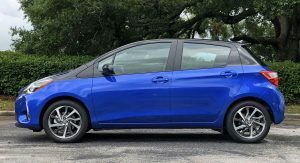 Review: Should You Consider The Manual 2018 Toyota Yaris 5-Door? 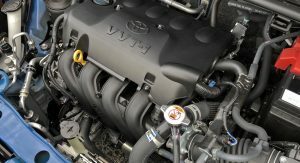 Toyota is well known for its economical, no-nonsense sedans and hatchbacks. 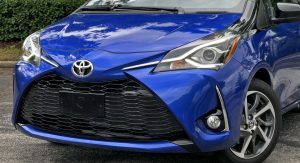 Since 2007, the U.S.-spec Yaris has upheld that notion with three versions: a four-door sedan, a three-door hatchback, and a five-door hatchback. 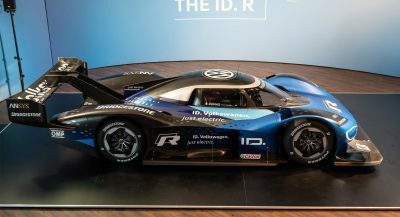 That same recipe returns for 2018, but with a dose of sportiness with its updated exterior styling. 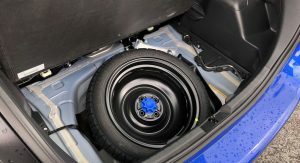 We spent a week behind the 2018 Toyota Yaris 5-Door’s wheel to discover if the new appearance translates to an improved driving experience. 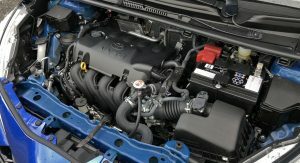 The Yaris’ 1.5-liter four-cylinder carries over unchanged, making an unathletic 106 horsepower at 6,000 rpm and 103 pound-feet of torque at 4,200. Thankfully, our tester came with the standard five-speed manual transmission. Rowing your own gears certainly injects some much-needed fun into the experience. It also saves $800 over the optional (and seriously outdated in the age of 7 and 8 gears) four-speed automatic. 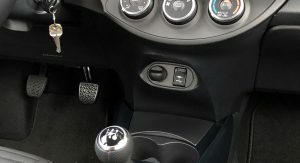 The manual gearbox offers is easy to operate, even for beginners. 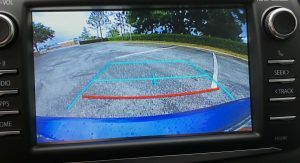 Manuals also make it easier to stay focused on driving rather than a cell phone, so parents of teens will approve. 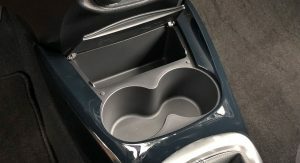 It also drops the chances of other kids asking to drive. That’s certainly a win-win. 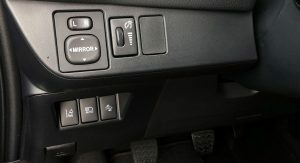 For us more seasoned drivers, the manual is a reminder of simpler times. 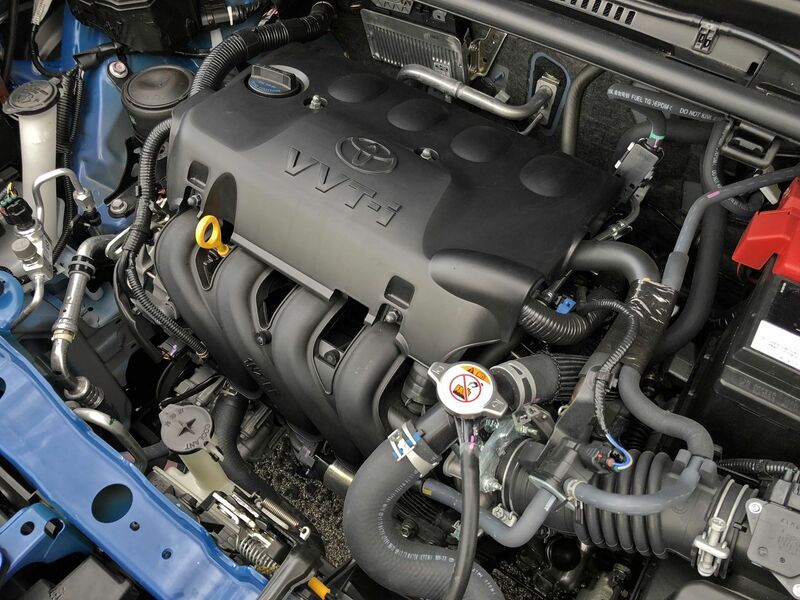 Behind the wheel, the 1.5-liter proves just adequate in moving the Yaris’ 2,315 pounds around. Power is made high in the rev range, so keeping the naturally aspirated engine spinning fast is key. We did find second gear to be rather tall, making for a dramatic drop in forward motivation compared to first gear. 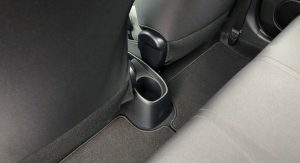 The clutch was easy to modulate thanks to its light spring and predictable engagement. Shifts are on the short side, but nowhere close to a Toyota 86. To the gearbox’s credit, we never missed a shift. 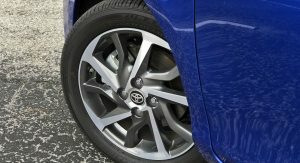 Of course, the Yaris sends its power to its 195-series front tires. 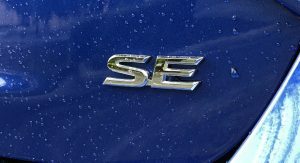 The SE trim does replace the 15-inch steelies with funky, 16-inch alloy wheels. 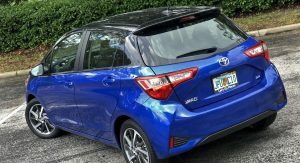 The upside to the 2018 Yaris’ diminutive powertrain is decent fuel economy. The EPA estimates the car will get 30 mpg city, 36 mpg highway, and 33 mpg combined. That’s not terrible, but not stellar either. 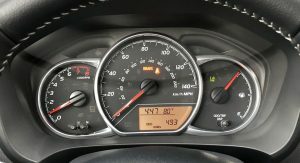 What’s more, we averaged only 28.2 mpg over 200 miles of mixed (yet spirited) driving. The steering and brakes don’t disappoint. 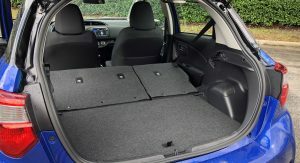 The car handles well for a non-performance oriented hatchback. The skinny tires grip better than expected and the steering is on the heavier side. We really wished for a telescoping steering column, though. 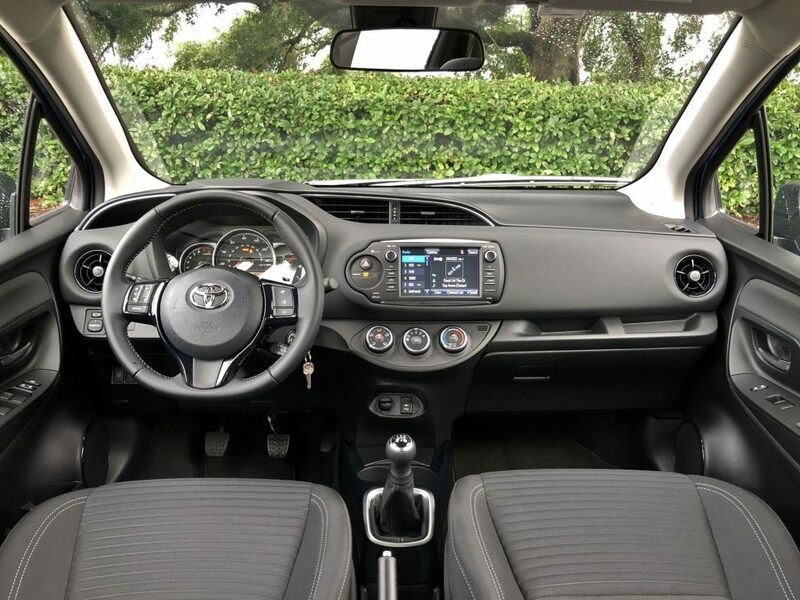 The 2018 Yaris’ interior hasn’t changed as drastically as the outside. 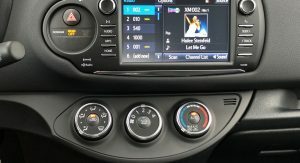 The familiar dash design is both interesting and functional. 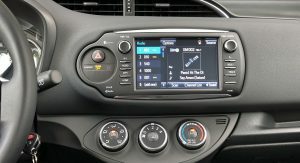 The SE’s standard 7.0-inch Entune infotainment system boasts SiriusXM radio, Bluetooth connectivity, Siri Eyes Free, a backup camera, and even GPS navigation. The five-speaker sound system is better than the speaker count suggests. 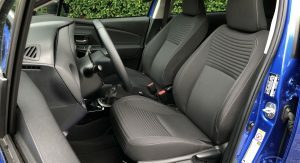 Comfort levels are average for this class, offering manual adjustments for the front occupants and decent legroom for those in back. Despite being black, the cloth seats show a tendency to show dirt. Conversely, the cloth is very breathable and resisted getting hot during the summer sun. 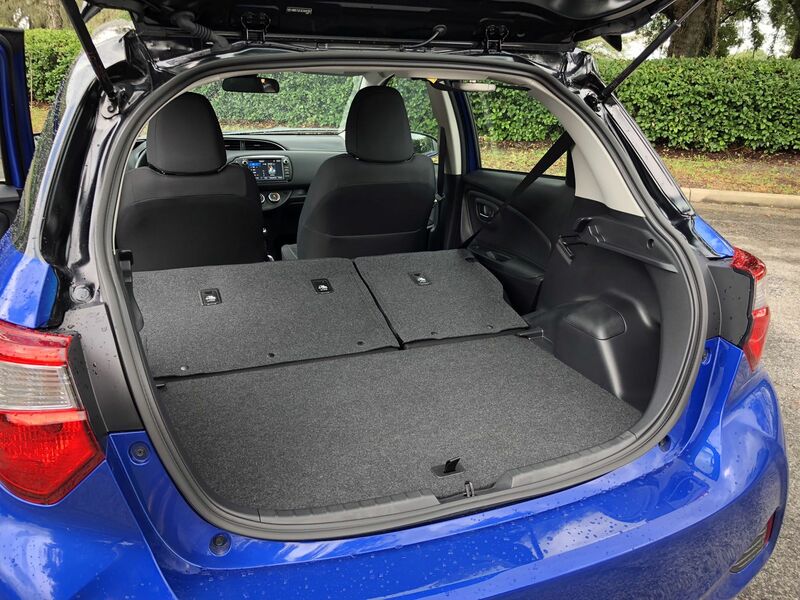 Another knock on the Yaris’ cabin is road noise. On rough pavement and at highway speeds, conversations require a slightly raised voice. That’s expected for a budget-minded subcompact, though. 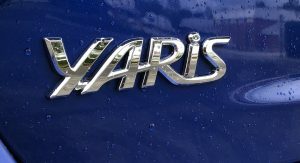 Speaking of price, the 2018 Yaris is good deal. 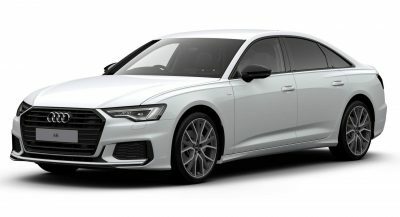 Getting the three-door variant requires only $15,635. Our tester, the five-door model in the range-topping SE trim, started at $18,260. The contrasting black roof is the only optional extra included, costing $500. Add in the $895 destination price, and our Yaris totaled at $19,655. 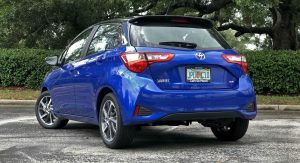 All told, the 2018 Toyota Yaris 5-Door offers good functionality, acceptable driving dynamics, and a fair MSRP. Its noisy cabin and surprisingly thirsty engine are its biggest detractors. 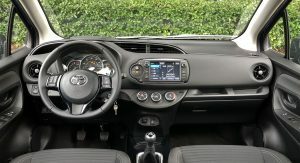 But look past the flaws and the Yaris -even with a manual, makes a great choice for city commuter or first car for a graduating teen. …seriously outdated in the age of 7 and 8 gears, four-speed automatic. See, I don’t really get this. 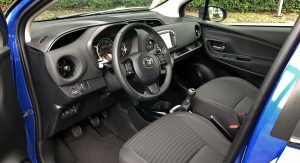 More isn’t necessarily better and if it is a city car then better to have a relaxed spread of less gears than something that’s constantly hunting for the next gear. 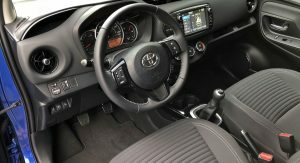 More than 80% of cars in the UK have manual transmissions, especially in small cars like the Toyota Yaris! I don’t understand why anyone would want one of these with a clunky automatic gearbox. 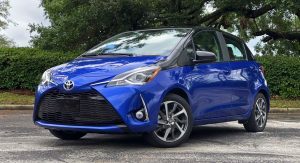 Is a Yaris with a 5-speed worth it? Probably. Is it more interesting than a Yaris with an automatic? Definitely. 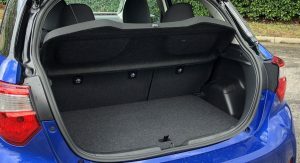 It’s not Audi A1 and it’s built to a price point, so don’t expect too much!! 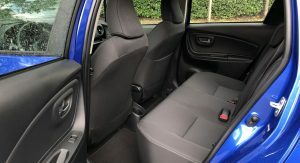 Why not get the Honda Fit Sport, which comes standard with a 6-speed manual, more power from the same displacement, and tons more space…for hundreds less?